Andrew at Swan's was a little late this year with his barley wine release. 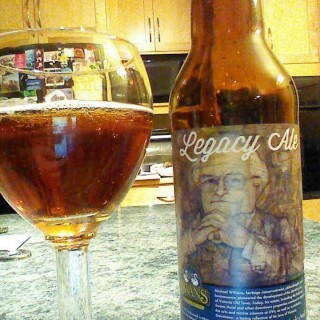 It was with good reason; the Legacy Ale was aging in a tank for eight months. Patience pays off. Barley wines in Victoria range from painful to bland; this one falls perfectly in the middle. There is enough sherry, sweet raisins, dark fruits and earthy hops to make your nose happy. The body is assertive, yet sippable and creamy without being overly warming. Each sip is complex enough to appeal to everyone. The first time barley wine drinker will enjoy the warming alcohol attack with dark fruits, raisins and hints of chocolate. The beer geek will love oxidation gone right with sherry notes and challenging earthy and herbal hops. Everyone's palate will be pleased by the long finish of syrupy raisins and warm sherry. There is enough complexity that cellaring will improve flavours. Do not delay, this is a very limited release.